In her extraordinary bestseller, Adrian Nicole LeBlanc immerses readers in the intricacies of the ghetto, revealing the true sagas lurking behind the headlines of gangsta glamour, gold-drenched drug dealers, and street-corner society. 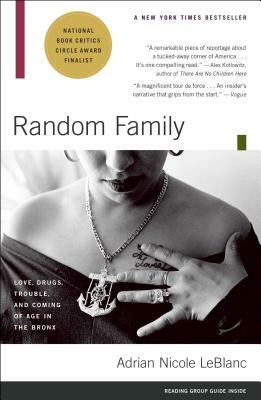 Focusing on two romances—Jessica’s dizzying infatuation with a hugely successful young heroin dealer, Boy George, and Coco’s first love with Jessica's little brother, Cesar—Random Family is the story of young people trying to outrun their destinies. Jessica and Boy George ride the wild adventure between riches and ruin, while Coco and Cesar stick closer to the street, all four caught in a precarious dance between survival and death. Friends get murdered; the DEA and FBI investigate Boy George; Cesar becomes a fugitive; Jessica and Coco endure homelessness, betrayal, the heartbreaking separation of prison, and, throughout it all, the insidious damage of poverty. Charting the tumultuous cycle of the generations—as girls become mothers, boys become criminals, and hope struggles against deprivation—LeBlanc slips behind the cold statistics and sensationalism and comes back with a riveting, haunting, and true story. Adrian Nicole LeBlanc's first book, Random Family, was a New York Times Bestseller, a finalist for the National Book Critics Circle Award, and the winner of The Anisfield-Wolf Book Award and the Ridenhour Book Prize. LeBlanc's work has been published in The New York Times Magazine, The New Yorker, Esquire, Elle, Spin, The Source, The Village Voice, and other magazines. LeBlanc lives in Manhattan. Alex Kotlowitz author of There Are No Children Here A remarkable piece of reportage about a tucked-away corner of America... It's one compelling read. Vogue A magnificent tour de force...An insider's narrative that grips from the start. Janet Maslin The New York Times Mesmerizing...The artistry of this frank, enthralling book lies in the utter simplicity -- and careful, subtle selectivity -- with which LeBlanc plainly describes the determining events in what will now be unforgettable lives. Newsweek Keenly observed, pitch-perfect...A dense, rich narrative that reads like a novel. Los Angeles Times A nonfiction Middlemarch of the underclass...A new benchmark in the field of immersion journalism.